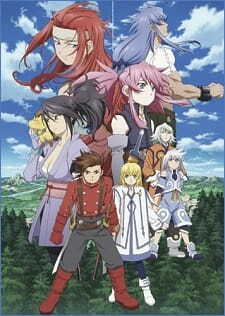 Tales of Symphonia Tethe'alla is the 4 episode OVA that follows the four episodes of Tales of Symphonia, only it's set in another world, known as Tethe'alla. To start off, if you've seen the first four episodes, you'll be aware that the episodes in this anime are quite long, about 40 minutes long as opposed to the normal length for anime episodes, about 20 minutes. This doesn't bother me in the least; actually, I found it quite refreshing, not having to click on a new link as often to continue watching the show. If you've played the game for this anime, you might be more familiar with the characters, plot, and overall universe, but as for me I had played it only briefly several years ago and didn't remember much when I started watching this. So don't think you need any background knowledge: I certainly didn't need it. Tethe'alla is an amazing world, bespeckled with grand castles, interesting people, highly advanced technology and something that made me rather excited to see: dragons. I loved the storyline in this world. Lloyd's adventures to save Colette caused him to come across new enemies and allies, and everyone has their own unique story to tell. At some points the plot took real twists -I would blink in a surprised fashion as I stared at the screen and wonder why someone had done something, or how something had happened. In this way, it became so that I couldn't figure out what was going to happen next, and for me watching something with unexpected turns is a real treat. Because Tethe'alla is a chapter only four episodes long, like the first chapter, things are going to be moving at a good speed to keep the plot rolling. There aren't any unnecessarily long scenes of reflection, and flashbacks are kept concise. Background information on characters is given to us, but we are shown only what we need to know to understand character motivation, so if you like seeing scenes that show more about the character's life I'm afraid you'll be disappointed. What I really liked was how there could be great action in one moment, and then, only a scene or two later, everything would slow down to give viewers some time to process what had happened while the characters recovered and figured out what to do next. Lloyd is a fantastic main character. He's charismatic, determined, strong-willed, and he keeps everyone focussed towards the goal of freeing Colette. I feel like the other characters fill in all the standard group holes: Genis, the cheerful companion who still seems a bit too innocent. Rain, the instructor and sister to Genis, ready to help out where she can. Sheena, the woman who is at first a bit of a mystery, and seems cold and distant, but later she shows that she's got an amazing heart. All of these guys, and a few more, really come together and make the perfect team. The music in this anime was definitely not what I was used to. It's got depth, layers, and it fits the scenes brilliantly, raising tension and setting the tone. If you're expecting to hear something catchy and memorable, no, it isn't. To be honest I can't remember one tune from the show. But that's what's different about it: it's wind instruments, drums, and so on, building up on emotion and just creating a great feel for the story. It didn't have to be catchy or memorable. The opening and ending themes were fantastic. They aren't the usual norm, either. If you're expecting classic J-Pop or J-Rock, no, you're not going to receive it. The songs are just beautiful. Entrancing. Delicate. ...And rather unprounceable. However, I enjoyed them, sincerely. I don't know what to tell you that won't get into the finer details of what you're considering you might watch. I won't tell you about the twists, or the ending (although I will say that it ended on a note that left too many loose ends, I believe we're in for a third OVA to tie everything up). However, I will tell you that in my honest opinion it's definitely an anime to set aside time for. If it doesn't captivate you by the opening sequence or by the end of the opening theme, then this probably is not the genre or anime you're looking for, though I assume you watched through the first four episodes to get here, so why even consider whether you want to see the Tethe'alla chapter? If you enjoyed the first chapter, you'll enjoy this one, and though it's an often repeated line it's completely true. With the first part of this game adaptation being rather lackluster, the second part is now upon us and it's time to re-ask the same question from the first part, how hard does this part fall over itself because of cut content? (+)Returning characters feel much more fleshed out. (+)When the new characters are introduced with more or less the same level as with the returning cast. (-)Core character downgraded to a plot device. The Story (8/10): With the carry on from part one, the story having layers stacked upon it now, the connections between the characters and the events surrounding them are becoming easier to tie lines between. The overall feel of the anime has improved as well, where as the first part felt like it was more about saving the world, this one is on a much more personal level, which is why I think that this story is better that part one; it's a lot more focused. For instance, in part one the show put emphasis on focusing how important the journey is to restore the diminishing world. Part two on the other hand is focused solely on restoring Colette, making the entire show all the more effective when aiming for the feels and there's a few of those moments spread throughout this part. The show does this while managing to keep the over-arching plot present, which is also another plus. The Characters (7/10): With the majority of the cast returning from part one, they feel a lot more whole and more like proper characters, with the exception being Lloyd and Colette. I feel like he's falling into what I call the 'Classic angry protagonist' abyss, where the character is trying to do their best with the given situation, but they can't help but get angry every time they feeling like, "I can't do anything and that makes me angry and sad. (like for example, Eren from Shingeki no Kyojin.) It was annoying in part one, and it's still annoying now. Thankfully though, that does change after a while. On the side of Colette she has been demoted from Core Character that actually has a presence, to a plot device that is more of a background prop, bad move series. Bad move. Aside from the returning cast we have several new characters, again I'm just going to stick with the main cast. Sheena Fujibayashi: Enemy turned friend and is more vulnerable than she seems. Zelos Wilder: The Child of Regeneration for Tethe'alla and the red head. Presea Combatir: A failed by-product of the Exsphere experiments and female lumberjack. Regal Bryant: The new character who gets the most development and a lolicon. One thing they did well while developing the new characters is that, while they were developing one character, they were also detailing some of the other ones, going to the extent of even giving one of them an episode long backstory. Of the new characters it's definitely Zelos that's the most underdeveloped, all I know about his is that he's the Child of Regeneration and that's it, and he stands out like a sore thumb for that very reason. The Art and Sound (7/10 & 6/10): The art hasn't really changed between the two entries, although you can start to see more of the famous animation quality from ufotable starting to seep it's way through, the 3D movement is again improved and the fight scenes feel like a much more basic version of the ones we saw in Unlimited Blade Works. Not exactly the kind of quality I expected from a company at the peak of their game. The Sound on the other hand has taken a slight dip in my opinion. The OP and ED aren't as enjoyable as part one's and they put in what I call 'Jump-scare queues' When they suddenly just put in a very loud sound for dramatic effect. Then again, the show's quiet when it needs to be for the emotional weight of certain situations, and the rest of the musical section is about as good as part one. What do you think of this anime? I think that this second part, as a whole, is a vast improvement from the first. The characters are more fleshed out, the art is finding it's feet, and the story is getting better. I wouldn't say I'd buy this anime though still after all of its obvious flaws.